10 Maharashtrian Wedding Foods That Are Tastefully Simple and Delicious! If you’ve gone through our blog on Maharashtrian wedding rituals, then you’d know that a Maharashtrian wedding is known for its traditional simplicity and cheerfulness. Similarly, their festive foods are a blend of heritage tastes and simple delicacies. Though some Maharashtrians are non-vegetarian, the wedding food menu will usually consist of vegetarian food. Scroll on to learn more! Kokum sherbet is a welcome drink served at Maharashtrian households and can also be served at weddings as a thirst quencher. As the name suggests, it is a juice made from kokum. It is seasoned with jeera and black salt for flavouring. ‘Batata’ refers to potato in Marathi. It is basically a ball of mashed potato coated with a thick layer of besan (a kind of batter). Makes for a great appetiser at Maharashtrian weddings. Served best with chutneys. In other words, vegetable fritters. 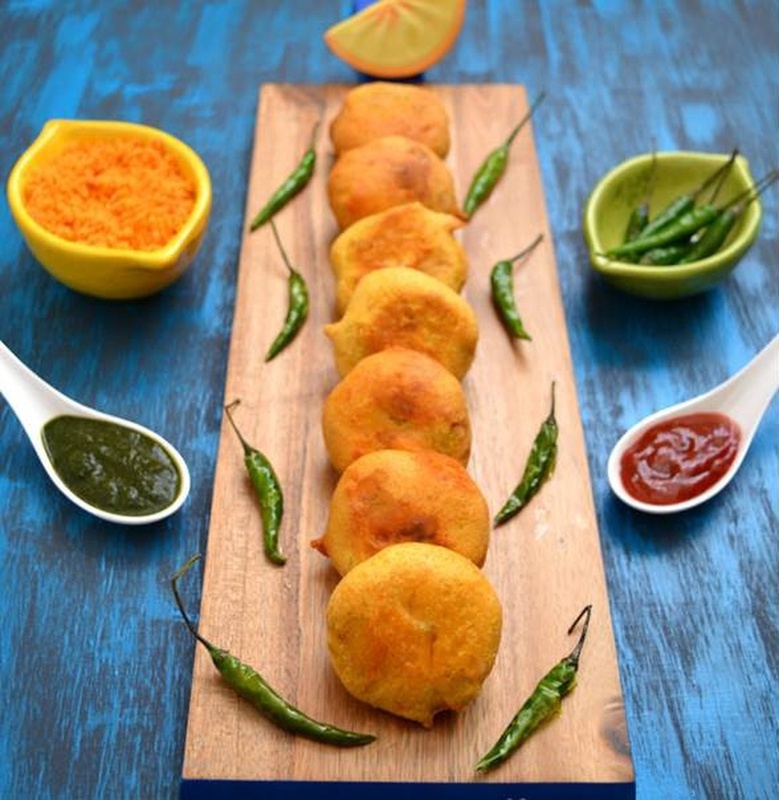 Bhajjis are a standard starter in every Maharashtrian household. Spinach and methi, onion and potato are often used. This refers to stuffed brinjal/eggplant and is an authentic Maharashtrian dish that is present at all weddings and functions. It is packed with flavour due to the choice spices used in its preparation. It can be eaten with roti or rice. It is the Maharashtrian version of potato fry or curry seasoned with spices and served with puri. (Deep-fried puffed bread). Can be accompanied with onion slices, lemon wedges, coconut chutney or pickle. Masala bhaat is essentially vegetable pulao. It is served as a main course in Maharashtrian functions. Its delectable texture and spicy flavour make it a popular dish. This is another rice-based dish. It is usually a Maharashtrian staple and made during festivals or pujas as well but can also be served at weddings. It is basically lentils/toor dal eaten with plain rice. Contrary to other Maharashtrian foods, it is not spicy at all and has a smooth, light texture. This is a sweet-dish that is popular among Maharashtrian families. It is a jaggery filled chapaati that can be eaten on its own but goes great with ghee, kudi or any other gravy. Another traditional Maharashtrian sweet dish that is made from strained yoghurt and sugar. It is one of the main desserts in Maharashtrian cuisine. It is flavoured with cardamom or saffron. Fruits and nuts are added as well. Rava che ladoo is a sweet made from semolina (sooji), cashew nuts and homemade ghee. They are traditional and made during festivals, pujas, weddings or any other small function as well.